Hitman 2 is an utterly sublime improvement over the previous outing. There's all the usual assassination fun we've come to expect from the series, with the added bonus of multiple missions, massive maps and several game modes to keep you coming back for more. 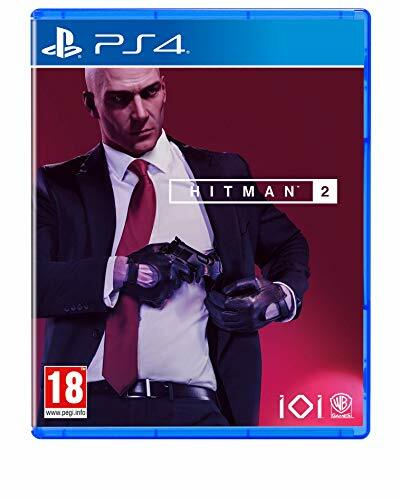 Agent 47 returns for another brilliant outing of assassination, fun and frolics all across the world in Hitman 2. There's a highly polished storyline delivered with fantastic style and finesse. At the end of the day though, Hitman 2 is really just an excuse to stealthily eliminate a target (or mulitple targets) with guts and guile. The locations of the missions are pleasantly varied – one minute you're in the peaceful suburbs of the United States, the next in the hustle and bustle of Mumbai, India. The number of missions isn't massive, with just six maps to explore. But that's the hidden beauty of a game like this, as you're encouraged to work through each map and unravel the hidden stories and opporuntinities within it – and, indeed, multiple ways to succeed in your mission. An unfortunate mishap with a wobbly car wheel, a poorly placed barrel falling on someone's head, a badly maintained engine exploding in an inexplicable fireball. Sure, there's something satisfying about garroting a mark or shooting them silently in the back of the head when no one is looking – but the 'perfect accident' assassination is more thrilling. Exploring reveals a multitude of objects in the environment you can interact with – from drinks that an be poisoned, to fuel drums that can be punctured; lights that can be broken and sprinklers that can be turned on. These are either perfect traps for your victim or an easy way to accidentally kill the wrong person if you're not paying enough attention. Each level can be completed in a variety of ways, but you're always encouraged to be professional. Avoid cameras, only eliminate who you need to, move silently without being spotted. For each mission you complete, there's also a chance to replay the entire thing by completing different 'story missions'. These are essentially different avenues to the targets that open up as you explore the world. They're brilliantly designed and an interesting way to add extra interest to each outing. You could just sneak through the map and take out each target with a single well-placed shot from a silenced pistol, but there's so much more fun to be had. Tracking targets' movements, watching for opportunities, casually spiking a drink with a laxative before drowning them in a toilet. The possibilities are endless. We managed to spend several hours in each location by exploring, planning and preparing to eliminate our targets. It pays to do so, as you're awarded experience points for not only discovering new locations within each map, but completing various challenges – changing disguises, finding hidden tokens, shooting pigeons, things like that. These mini-missions range from the silly to the downright sadistic. One challenge had us dressing up as a chef, only to batter several fellow cooks with a frying pan. Seemed a bit harsh since all they were doing was cooking food for the party guests and posed no threat to us. Still, it had us chortling anyway. Incapacitating 10 guards with a large wet fish was weirdly satisfying too. For a more classic Hitman experience, you're also awarded for taking things a bit more seriously. Eliminating the target while only wearing your suit, never being spotted, only killing the target, avoiding cameras and, of course, making the target have an 'accident' so it looks like you were never there in the first place. We love the satisfaction and frustration that comes with the more difficult challenges. Regular saving is essential to avoid ruining it when a camera you haven't spotted records your movement or a guard you didn't account for notices you. A picture-in-picture display also appears when something has happened. This alerts you if you've made a mistake or something is noticed, such as a body discovered or footage from a camera that's spotted you. Sometimes if things go wrong they can be rectified. If a camera spots you, you can track down the security room and destroy the recordings – providing you can make it through the throng of guards that are inevitably protecting it. Other times your plans will just fall apart and you'll end up loading a previous save and starting again. If all else fails, you can always grab a gun and start blasting, but you won't survive for long. Enemy artificial intelligence is pretty savvy at swarming and overwhelming you. If you're a perfectionist then you'll want to play on the Professional difficulty so you can save as often as you like. The more challenging Master difficulty level only allows a single save per mission. As if that wasn't hard enough, more cameras, extra guards and attentive non-playable characters (NPCs) are added to the mix too. The large crowds are back and that's always been a favourite part of the Hitman series for us. Moving unseen through the masses while scoping out the environment, looking for tools, trinkets or hints to help you complete your mission. Of course, you need to account for all these extra eyes that could potentially see your misdeeds as well. Civilians aren't shy about rushing off to rat you out. On the standard Professional difficulty, we found the game to be a lot more forgiving than previous Hitman games. We remember a time when if you donned a certain disguise then anyone also wearing that uniform would immediately see through your ruse. That's no longer the case. Instead, you have specific people within each group who will notice something's wrong. As with previous Hitman outings, there's plenty of comedy moments to go along with the carnage. Daft things like blowing up a target by planting bombs in mole hills or dressing up as a real-estate agent to show a target around a house offer a touch of light relief from the senseless violence that naturally comes from being an assassin. Beyond the standard missions, there are also elusive contracts – where a new character appears on a familiar map and needs assassinating before the time is up. Ghost mode allows you to compete with other players to complete assassinations with the best style and points in the fastest time possible. This mode is a lot faster paced than the rest of the game, which is either jarring or a refreshing change depending on your outlook. Interestingly, if you have the previous game then you'll have access to all the missions from that within Hitman 2 – but with the updated features in the new release. This gives even more content to play around with and a wealth of missions to get stuck into. We'll admit to being a little frustrated with the game in certain ways though. Each mission only initially lets you start out with a pistol, fibre wire and a handful of change to distract your adversaries. If you want to snipe enemies from the rooftops or a nearby tree house you'll have to wait until you've unlocked a rifle. Hitman 2 is an utterly sublime improvement over the previous outing. It's everything we know and love about Hitman, but with less episodic misery. The time it takes to complete is entirely up to you, based on the way you play and how much time you spend on all the challenges and story missions. Sure, six maps might not sound like much, but there are masses of areas to explore, NPCs to observe and various scenarios to follow.